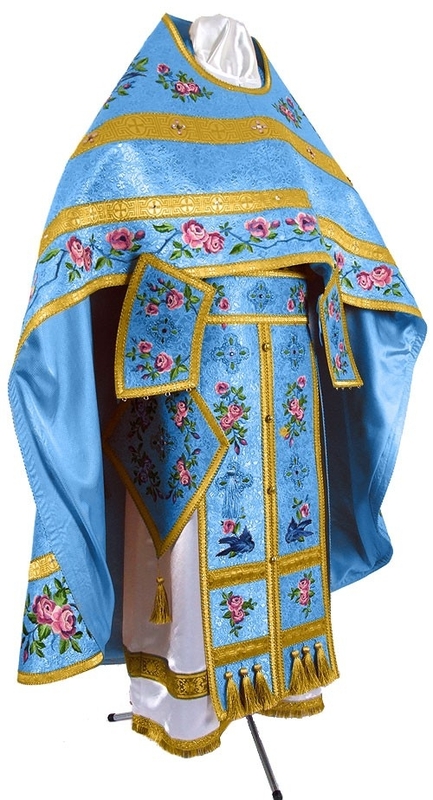 Istok Church Supplies stocks an extensive collection of Russian priest vestments in blue and gold to help Russian Orthodox Christian priests perform Divine Services while being properly outfitted in comfortable formal attire. We have been creating custom liturgical vestments for many years now and are proud of our reputation as trustworthy suppliers who create bespoke vestments with utmost care to tradition and workmanship. 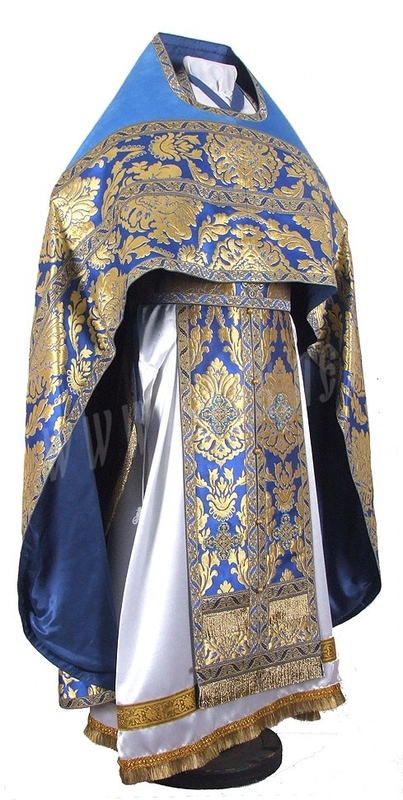 From resplendent metallic jacquard brocade and attractive rayon jacquard brocade to delicately embroidered fabrics and heavy duty German velvet, we offer different fabric choices for our Russian priest vestments in blue and gold. Customers who wish to purchase a particular product in a different fabric belonging to same price range can select from the fabrics section and provide instructions in the Notes section. 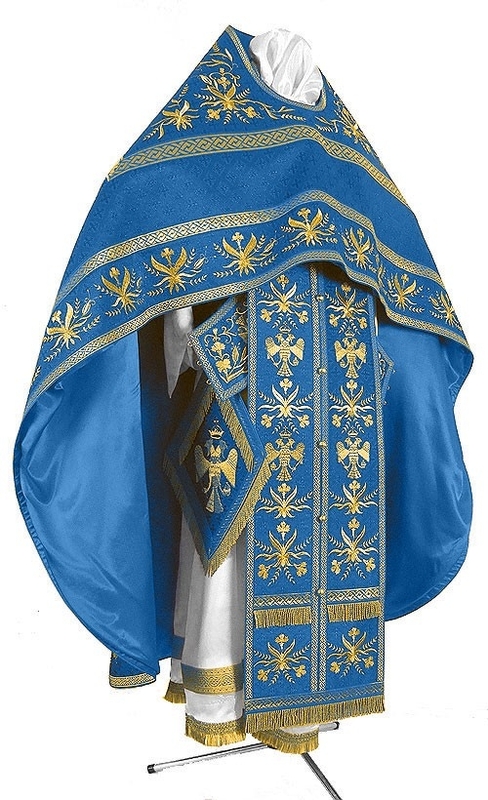 Blue and gold priest vestments are commonly used for occasions such as Feasts of the Theotokos, Annunciation, feasts of Virgins and more. 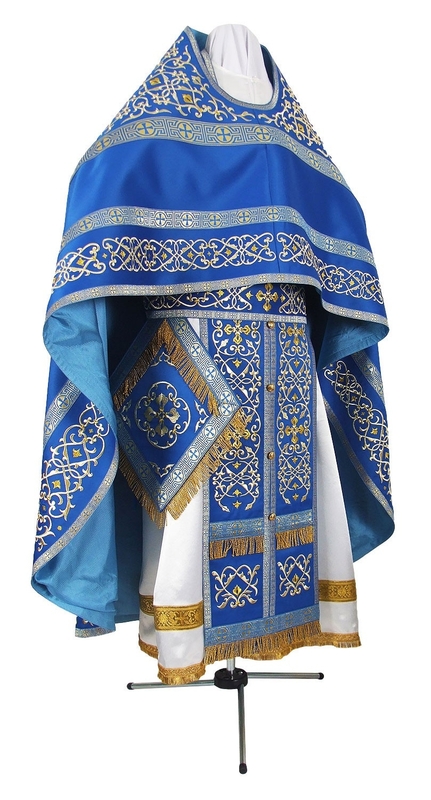 Our Russian priest vestments blue and gold are available as complete sets that contain six main items – epigonation, epimanika, zone, epitralhilion, phelonion and nabedrennik. Customers can choose to add matching chalice covers and a matching podriznik to their orders. We provide natural rayon lining for our Russian priest vestments and customers can add natural velvet inserts for added beauty and comfort. Customers can choose from a variety of embroidered icons to enhance the appearance of their custom vestment. Customers can choose from three types of decoration – standard, premier and luxury. The standard type decoration is economically priced, the premier type is in the mid-range and luxury type includes high end adornments. Each order is painstakingly constructed by our skilled ecclesiastical tailors in Europe based upon the individual measurements provided by you. We require a few weeks to complete custom orders and we request you to place your order well in advance if you need it within a particular time frame. We stock only the most beautiful, best quality Russian priest vestments. We hope you enjoy browsing through our collection as much as we enjoy curating it.